UPDATED: October 6, 2016, at 8:15 p.m.
Harvard’s dining services employees were joined by workers from Boston as they continued to rally support in their historic strike's second day on Thursday. 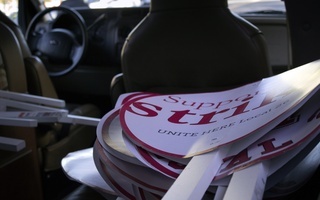 The earliest picket line on Wednesday sprung up around 5:30 a.m. in front of the Harvard Kennedy School on JFK Street. 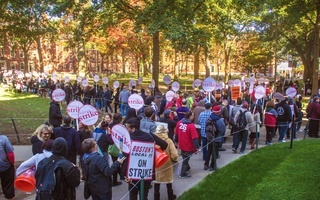 Throughout the rest of the early morning, picket lines were thin and subdued compared to the boisterous crowds who demonstrated on the first day of the strike, though by mid-morning Local 26 workers were once again out in force at locations across Harvard’s campuses—including in front of the Law School and in Longwood. Harvard's dining services workers and supporters continued their picket Thursday, as they demonstrated by the Science Center. Protesters gathered in the Science Center Plaza around 1:30 p.m. for a brief reprieve from picketing. The Undergraduate Council allocated $200 on Thursday for providing workers at the rally with coffee and donuts, according to Undergraduate Council President Shaiba Rather '17. Picket lines were scheduled to resume at 2 p.m., with the bulk of the protesters headed to the Faculty Club. 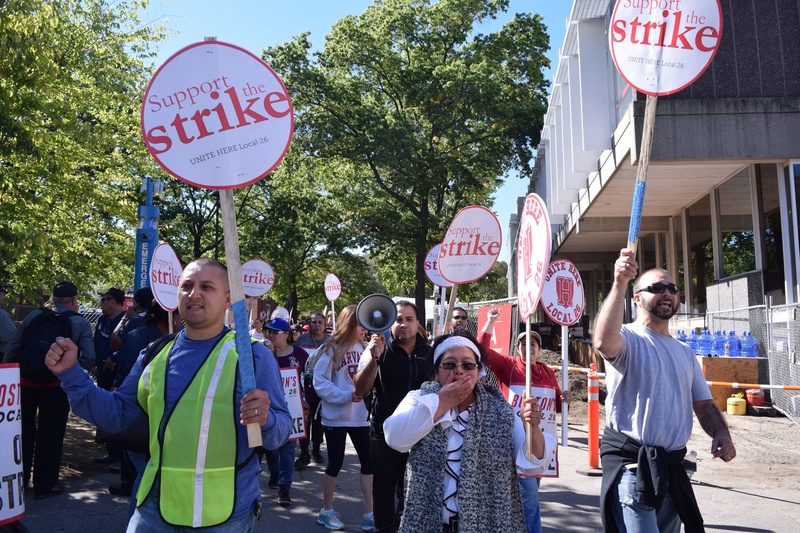 Hotel workers and dining hall employees from other union outposts in Boston joined HUDS workers on the picket lines to supplement what was, on Wednesday, a 600-person strong crowd of protesters. Harvard’s dining service workers kicked off the first academic-year strike in their history Wednesday morning and staffed picket lines throughout the remainder of the day. “Hey Harvard you can’t hide, we can see your greedy side!” picketers and supporters chanted as they marched around Annenberg dining hall around noon today. The protesters numbered in the hundreds, gathering on the sidewalk in front of the dining hall and forcing many students to walk on the grass around them. Support for HUDS workers continued to grow among students throughout the evening Wednesday and through the early morning on Thursday. Anwar E. Omeish ’19—a member of the Student Labor Action Movement—said the organization had been supporting the strike in various ways of the past few days, including supplying food and organizing some events. At around 5 p.m., for what students called a “dine-in,” HUDS workers and student protesters marched several times around Harvard Yard and Mass. Ave., before congregating in the grass between outside Johnston Gate. As protesters marched, a few undergraduates lined their path, handing out food from Harvard dining halls to HUDS workers. After the marching ceased, students, HUDS workers, and other protestors congregated in the grass for several student speeches and performances, including songs from undergraduate groups like the Veritones and Kuumba Singers, as well as a student beatboxing and breakdancing performance. Scattered throughout the performances were several students’ testimonies about HUDS workers and their impact on student life. Noah R. Wagner ’18, for example, recalled several snowstorms in 2015 when workers slept on campus in order to avoid traveling in inclement weather. Though HUDS workers were invited to speak at the SLAM-organized event, none took the microphone. Joining the protest were about 200 undergraduates, who ate dinner on blankets and metal chairs in the Yard. The strike has continued to affect dining options on campus. Annenberg Hall was closed to upperclassmen in response to high demand, according to an email sent to Adams House residents by Taj Michael Smith, the House’s academic coordinator. Additionally, interhouse restrictions were mostly lifted except for at Eliot House, where only Kirkland residents will be allowed to eat because of their own dining hall’s closure. Harvard and the union met for a bargaining session Thursday afternoon at an undisclosed location on the University’s campus in the hopes of halting the strike and coming to an agreement. While Thursday’s negotiation session did not yield a settlement on a new contract, the two parties have scheduled another session for Friday. Economics professor Lawrence F. Katz and Robert B. McKersie, professor emeritus at MIT’s Sloan School of Management—both veterans of recent union negotiations involving Harvard—will join the bargaining session as outside mediators. HUDS has been in contract talks with Harvard for nearly four months—a process protracted by impassioned debate over the workers’ health care benefits and wages. —Crimson staff writers Derek G. Xiao, Hannah Natanson, and Jalin P. Cunningham contributed reporting.